I must say, I never expected my little apple butter sauce to cause such a stir (no pun intended–oh, all right, pun intended). It always amazes me which blog entries elicit a strong reaction while others, like Andy Garcia, might be on par with their (more popular) contemporaries, but for some reason still don’t garner the recognition I think they deserve. I’m glad so many of you liked the idea of apple butter in a BBQ sauce on tempeh. (And now the pressure’s on to create some other ostensibly innovative or creative recipe for my next blog entry. . . . collard cake? Turnip pasta? Eggplant cookies ?–oh, forgot, I actually did create that one). Well, I’ve got nothing on the cutting board at the moment, so I’m afraid it will have to wait just a bit. You see, I’ve been spending a lot of time at my computer recently, working on that pile of papers and online course work. Mostly, I’ve been feeling frustrated because (a) the pile seems to be expanding of its own accord (sort of like my waistline); and (b) I’ve been spending less time focused on blogging as a result. I’ve also been feeling a bit creeped out, as it happens, since our landlord is having the exterior of the house painted, and every time I glance toward the window to catch a thought or a glimpse of the sky outside, I’m confronted with a close-up of a man’s paint-splattered face, as if our window were a giant flat-screen TV right beside my desk. Well, a couple of days ago I was tagged for a meme by the lovely and talented Holler of Tinned Tomatoes. As it turns out, I’ve already prepared and consumed my salad (twice!) for Holler and Lisa’s upcoming No Croutons Required Event; unfortunately, I haven’t yet had time to write the blog entry about it. Instead, I decided to focus on some earlier blog photos to send Holler’s (and your) way. The meme asks for your “top ten” blog photos. As I mentioned in my comment to Holler, I had to laugh at that request. As someone who knows nothing about photography and owns the cheapest camera possible (okay, a disposable might be cheaper), I never really focused that much on how I photograph the food; it’s only recently that I’ve begun to think, “hmmm, a better camera sure would make blogging easier.” For now, a new camera will stay on the birthday wish-list. I wondered how to select ten, when it was so hard to choose even one that I really liked. “Do I choose the top ten in terms of page hits? Or the top ten in terms of aesthetic appeal? Or should I emulate Johanna at Green Gourmet Giraffe, and choose the ten photos that meant the most to me?” I decided to go with Johanna, who always seems level headed and whose logic I like. I usually take photos of food close up, partly because I have an extremely small surface area of the kitchen table that attracts full sunlight, and partly because the rest of my kitchen usually looks like the post-cyclone scene in The Wizard of Oz and I’d be mortified if it got into a photo (unless, of course, I decided to show it to you myself , as in this blog entry). The cauliflower soup photo was the first time I’d consciously attempted to “style” a shot, and the feedback about the photo was so positive, I will always have a soft spot for this one. Poor quality photo from a neophyte blogger, but this pic of four of my champagne flutes on December 31, 2007 has sentimental value. Ever since I moved into my first apartment as an adult, I’ve collected individual, unique champagne flutes, and many were received as gifts (in fact, one of the first gifts the HH ever gave me was a handcrafted pewter-stemmed flute). Each glass has its particular story or background, even if the story is, “I found this for 25 cents at a garage sale!”. I’ve sampled champagne from each and every one of the 21 in my collection, and they are all my favorites. This photo is dear to my heart, both because the recipe is from the first cookbook I reviewed on this site, and also because the book itself was the prize for a contest I won. I loved the actual pie as well (hmm–should really make that one again), and I know that Nava liked the photo, so it means a lot to me. In real life, the drink in this photo was a plain, dull, swamp-like olive green. . .not the most appetizing color for a food photo. But somehow, wrapping that napkin around the stem of the wine glass elevated the smoothie to something elegant and even romantic. And since the taste of the drink was truly sensational, I was glad I could make it seem more appealing. I love this recipe. This was a dish I re-vamped from an old recipe, one I found in a cookbook I’ve had forever. The HH and I feasted on this tagine many times over the winter, and I was happy to see that readers liked it, too. When I look at this photo, I can almost see the rich, sweet-and-savory sauce and the multiple layers and flavors in the casserole. Comfort in a bowl! Strangely, though I’m not really a salad person, I love this photo. And the salad isn’t even dressed in it! But I think the simplicity of the veggies and the bright colors allow the purity and beauty of the fresh food to shine through. When I know I should eat salad and don’t feel like it, I just look at this photo. This is my favorite photo of Chaser on the blog. This photo of her as a pup was taken on a very hot day on our old deck, after the little tornado had leapt across the lawn, nipped at the water hose, chased balls, eaten some grass, growled at Elsie, shredded a rope toy, and tried to chew the plastic chair leg before her. She finally stopped to take a break and pant a bit–and I snapped the photo. I think the impish nature is encapsulated in her lolling tongue, the mischievous glint in her eye, and the end of her collar askew. Is she cute, or what?? This is my favorite photo of Elsie on the blog. The HH and I still erupt into paroxysms of hysteria when we see this. I was taking a break from blogging at the time, but Elsie simply couldn’t resist updating all of you. Notice that she types with a mini dog biscuit at the ready, beside her left paw. Really, she is such a remarkable dog! This was one of my favorite recipes I’ve made so far. Besides the intense purples and pinks being so visually appealing, the soufflé itself was easy to make and came out delicious–light, fluffy, moist, sweet (but not too sweet), fruity, and all around irresistible. I caught this photo after the HH and I had each enjoyed a huge serving and would have liked more. I think this recent photo is my favorite so far (if you exclude the dogs’ photos), mostly because of its simplicity. I love the contrast of the green on the red, the fact that there are basically only 2 colors in the photo, and that the grounds of pepper are actually sharply visible (my cheap camera performs, for once!). I also loved the taste and texture of the mayo, and it’s become a staple recipe in our house. In fact, it makes me want to go and have some right now. After selecting the photos and reading through this entry, it suddenly struck me: THERE ARE NO PHOTOS OF CHOCOLATE HERE! Astonishing, truly. It’s not that I no longer love chocolate or that it’s slipped from Number One Food Spot in my esteem. No; it’s just that I haven’t been able to adequately capture its magical essence in any of my amateur photos. Gives me something to shoot for in the next 200 or so blog entries. . .
I’m not going to tag anyone specific, but I will say that it was a fun challenge to come up with the selections, so if you’re interested, please share! You really do have great photos! And seeing the pic of the butterscotch pie reminded me I made it right after you posted about it. I wasn’t blogging yet, but I had to have that pie. It really was delicious! I have always admired your photos, Ricki–I think they are lovely! The ones you picked for this post are, as always, beautiful! Your photos are great for a non-photo person with a cheapo camera! I enjoyed reading about each one. Yikes… collard cake? Well, I DO like both collards and cake, so why not together? ALL of your pictures are amazing, not just the ones you chose. Your pix are terrific and the food sounds delish! Your photos are incredible! I am amazed – each one is truly a work of art! Chaser. omg, Chaser. too. forking. adorable! thanks for those kind words ricki – I am really glad to see you do this meme as I think your photos are great – in fact I also have a post-cyclone kitchen but you seem to hide yours more successfully than me as I often admire the pristine surfaces. Am glad the girls got a look in and it was interesting to hear some background to some photos (and your blog) – would like to tell you my faves but I like lots of them – maybe the cauliflower soup and of course the elsie on the keyboard and that cheeky chaser – I’ll stop listing them and just say all of them! I loved this entry! (I also love Andy Garcia, but I digress…). You have some really beautiful pictures, and obviously a load of talent, because I’m also a newer blogger with a budget camera, and your pictures put me to shame! Your house painting worker people comment made me laugh! A few years ago workers were resurfacing our apartment building and they were in front of our tiny bathroom window. I put up a few pieces of paper to block the view, but every morning when I was in the shower I could see their eyes at the tiny seam between the paper & frame (luckily the shower was directly under the window, so they couldn’t see the tub or its occupants!) Creepy!! I appreciate so much the quality of your photos as I am ususally too impatient and hungry to take photos of any real quality. Key Ingredient is doing a Berry Event and I wish you would enter your French Toast Souffle. It’s so unique and colorful. About runner beans – yes, they taste like green beans, but because they are flat you get a lot more flavor from them. I get embarrassingly excited when I find them at the market. I think your photos are amazing Ricki. I bet it was fun looking back on all the photos as well. Who else but food bloggers can look back at all their meals with such sentiment? Actually, I think your photos are super, especially that “neophyte blogger” one of the gorgeous champagne glasses! You just don’t need a fancy camera to take great photos any more. All you need is a good eye and it seems clear that you have that! Funny I should find this post on your blog this morning as I dropped by to tag you for the “Six Random Things About Me” meme!! What a fun meme! All the photos are gorgeous! Agh this is the second time I’ve lost my comment on your page! Anyway, great photos! I love the ones of your dogs, and the butterscotch mousse pie. And cookies with eggplant in them? I love how you do different things like this. Very inspiring. I think your photos are just lovely. And, I absolutely adore your recipes and plan to try many more. I’ve never once been disappointed. Your post was great but number 5 (salads) and number 4 (Chaser) have the same link! You see? One can spend a fortune on ‘good equipment’, but it’s the operator of said camera who actually makes the image. Beautiful selections! Love your number one choice – simplicity is a grand thing indeed – but I kinda love the quinoa and olive dish, too. As for the lack of chocolate, frankly I am shocked (not!). Thanks! It was difficult, but more because I had a hard time finding 10 that I actually liked! So glad you tried, and liked, the pie! It was one of my favorites when I was testing out recipes from the book. Thanks so much. Glad you liked them! Unfortunately, Chaser feels the same way. Oooh, I think your story wins for “creepy”!! I probably wouldn’t have bathed until they were gone (yeah, that would show ’em!). And isn’t A.G. just the sexiest? Thanks so much! Yes, it was fun to remember all that food we’ve eaten. . . also reminded me that I want to make some of these again! Not shocked that there’s no chocolate? But–it’s CHOCOLATE. I think I compensated in what I ate, even if I didn’t photograph, though. chaser is my favourite!!! your photos are vibrant and very expressive. 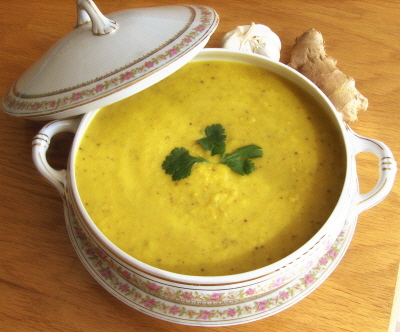 I think my favourite from your photos is the bowl of soup, the bowl is so pretty! (i want one!) The champagne glasses are pretty cool too.